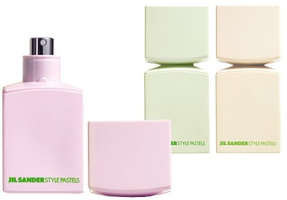 Jil Sander has launched Style Pastels, a trio of limited edition variations on the 2006 Jil Sander Style fragrance. All three of the Style Pastel fragrances were developed by perfumers Bernard Ellena and Lucas Sieuzac. Jil Sanders Style Pastels Blush Pink ~ a powdery-woody floral; the notes include neroli, violet, heliotrope, soft woods and amber. Jil Sanders Style Pastels Tender Green ~ a fresh green floral; the notes include green tea, bitter orange, jasmine and musk. Jil Sanders Style Pastels Soft Yellow ~ sunny, fruity and spicy; the notes include bigarade, freesia, orange blossom, vanilla, creamy woods and amber. Other recent launches from Jil Sander: Sport Water & Sun Men Fresh, Style Summer. I was just thinking of Jil Sander fragrances today and isn't she the one that did those “t-shirt” bottles? They don't sound exciting but they don't sound horrible either. The pink sounds quite nice. They all sound so good! And love the bottles. THEY LOOK DELISCIOUS AND CUTE. Adorable bottles!!! Great idea, love them, gotta have them! The best part? They sound great too, light n fresh, carefree… but too cute! Woody-powdery-floral? POWDERY? Gotta have that one! Sunny, fruity n SPICY? Sounds great too! I think the green one is worth a try just because I love green tea and I love jasmine… my poor wallet, but oh well this is just too cute. I am loving this article! The bottles are cute, I will go give these a sniff today. I could be wrong but the T-shirt bottles you describe sound like the Sonia Rykiel frangrances. Oooh, the pink one sounds interesting to me. I'm not into the bottle design, though–it reminds me of a plastic Nasomatto bottle or something! I've just seen those pretty bottles on fragrantica.com and was wondering how come the news is not here yet:) The “creamy woods” sound worth a try! I wish they would be available in miniatures,otherwise what will I do with all those perfumes I bought because the bottle was just so lovely? I'm a sucker for opaque bottles too. Still want those 2 newish ones from Reminiscence. None of them are wowing me but agree on the bottles! And I thought Stylessence was really nicely done. Too bad they didn't do a little coffret of 15 ml bottles…everyone would buy one! Let us know how they are! Oh that's a great idea, a sampler of all three would be nice. The green one didn't smell good, the pink one smelled like cheap shampoo and the yellow one was okay. The bottles were kind of cute in real life. And they're not actually T-shirts, they're short-sleeved sweaters (not that it makes much difference), which Rykiel used to do a lot of. The second Rykiel scent was really good, a warm, rich, caramelly gourmand; it was the first one in that short-sleeved bottle, and the EDP was in an opaque bottle with the name “Rykiel” in rhinestones across the front. (Her first scent, 7ieme Sens, was discontinued before I could try it.) None of the subsequent Rykiel fragrances (that I tried) were nearly as good, particularly the first men's scent, Rykiel Homme, which was musty and grim. I can't get away with pastel colors, so I can't imagine getting away with a pastel perfume. Green sounds closest to what I'd like, but I have a feeling they'll be far too powdery for me. See above — first reports are not good! Just how many fragrances has Jil Sander Released since it's Inception? it seems there are flankers hers, flankers there and new frgarances almost with the same rapidity as Hugo Boss! not that i am saying anything bad about it, but it's hard to keep track and hard to find them all is it not? some seem to never be released in this country and some seem to dissappear so quickly… i have been trying to find someone or somewhere where i could find a list of all the fragrances from the house so i can distinguish which are the ones i have smelled and which are ones i have never smelled! it's truly and utterly confusing! Thanks. I had a friend that use to wear one of them and I've been looking for it and I couldn't remember who made it. Take a look at basenotes.net – their directory is pretty comprehensive. I've just checked and they have a massive list of Jil Sander fragrances. I'll have to have a smell of the pink and yellow ones as their notes sound nice and Jil Sander does seem to do spices well. I like Sun and No.4 particularly. Second that — Basenotes is the place. I like it on the green bottle, but would have been cute if they'd used a hot pink on the pink bottle, etc. In which store did you find the Jil Sander Style Perfumes? I'm searching for a store really badly and had a really hard time to find one so far! Hi Robin! I hope all is ok with you and the rest of the NST team. I tried this just yesterday here in Riyadh. I smelled the three variants. The green and the pink smelled cheap BUT the yellow one has very good smell! Lasts 8 hours on my skin! Here in Riyadh, each bottle costs 250 riyals (about US$67). Will keep reading your excellent posts! Thanks Edward — I still haven't smelled these, and do wish Jil Sander had better distribution in the US. Neiman Marcus here picked up their Scent 79, but not these. ok 2day is offically one of the best days ever!!! another wonderful find!!! blush pink and tender green are now at ulta.com! once again im so excited and i cant wait!!! im offically going bankrupt! hope soft yellow comes soon! Thanks so much — didn't know they were in the US at all! me neither! looks like you got your wish with more of her stuff being distributed in the us!! im so excited! so i tried them at ulta 2day and bad news! i LOVE them all! Tender Green is my favorite! followed by Soft Yellow and Blush Pink! theyre all so nice and i just have to have them! the bottles r so great too! whats that like almost $200! o who cares! i really love them! Thanks — did not even know they were at Ulta!